Interestingly, the last decade has witnessed some phenomenal leaps in the technology domain, notably in AI. As compared to the early days of speech recognition, smartphones we use today have transformed themselves entirely; they are more like our virtual assistants: the reason being quantum advancements in Deep Learning and Machine Learning. The craze surrounding Deep Learning continues to grow. In this blog, we will evaluate whether the trend is going to stay for long and influence the future of AI or is it just a hype which will soon disappear into thin air. 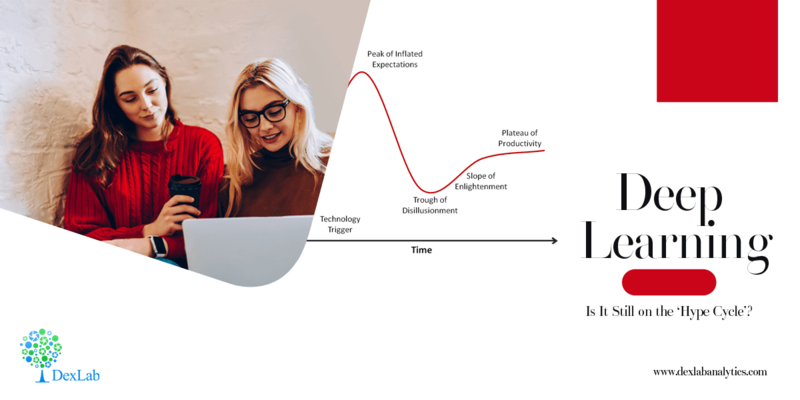 In simple terms, a ‘hype cycle’ refers to a curve that escalates to a peak at the start, then drops sharply and gets into a plateau. Perhaps not surprisingly, Deep Learning has been a part of diverse ‘hype cycles’. Currently, if you follow the tech market statistics, you will find that DL is yet to reach the plateau of productivity, where it would be largely accepted by the public and leveraged for daily work. As of now, DL hasn’t reached that stage, that’s why we can’t confirm whether the technology is going to stay or dwindle away. Following present-day market trends, we can say that virtual reality and augmented reality are close to the plateau of productivity. Years back, when these advanced technologies were launched they exhibited the same hype as Deep Learning. However, with time and development, they are now on the verge of becoming main-stream and we expect the same for our new friend Deep Learning. In fact, if we see from the perspective of a DL enthusiast, we will discover that DL has been more than just a hype – it has actually done wonders in diverse fields – from playing games to self-driven cars, DL technology is used in almost everything ‘technological’. In 2016, an AI-driven Go-playing system won over Korean champion Lee Sodol. Not only did it defeated the opponent but also excelled to become the best of Go, acing the strategy game. Tesla too leverages the Deep Learning technology for their self-driving cars. Next, Amazon’s Alexa is heard to use the divine technology of DL to make love-life predictions. It will suggest you what went wrong between you and your consort. Looking for an artificial intelligence course in Delhi? DexLab Analytics is here with its encompassing range of in-demand skill training courses. Check our course itinerary and suit yourself. Put simply, Deep Learning is the revolutionary new-age technology. Organizations are investing funds and resources all over the world. Considering the current growth rate, DL technology is soon expected to break into the mainstream industry replacing all conventional modes of technology and communications. With AI being the topic of discussion in almost every industry verticals, DL has been gaining popularity. No wonder, it has proved tremendously beneficial in the past but the future expectations are pretty high as well. In this case, we have to wait and observe how Deep Learning manages to fulfil industry expectations and stay inside the ring! Delhi is home to a bevy of reputable Deep learning training institutes. Browse over their course details and pan out the best from the lot.